Five flights. Four aircraft types. Two airlines. Two maintenance bases. Two catering kitchens. One hotel. One farm (yes, a farm). One flight training center. One airline headquarters. One medical center. And I just missed a traditional village. In 72 hours, I had the chance to experience all of this with Korean Air. (The entire trip was paid for by Korean Air.) See Part 2, Part 3, and Part 4. It sounds like an interesting trip, but you know what made this unique? Every single one of those things is owned by Korean Air or its parent, Hanjin. If you thought Delta buying a refinery was a stretch then get ready to see how things work in Korea. In 72 hours I was able to get a sense for what is really a very different kind of airline than what you’ll find in the US. Korean runs two daily flights from LA to Seoul’s Incheon airport. The first is a daylight trip on the A380 with the second being an overnight trip, usually on a 777-300ER. The A380 departure on the return is in the afternoon followed by the other departure in the evening. I can’t sleep on airplanes so I was clearly going to take the A380 out. I thought about doing the return on the evening flight, but due to maintenance, they had an older 747-400 with the old interior operating that day. I was more interested in seeing how the new flat beds were for sleeping, so I stuck with the A380. The night before the trip began, I tried to check in for my first flight online, but that wasn’t to be. Apparently Korean requires you to be registered to check in. I signed up for a Skypass account, but I put my first name as Brett whereas the ticket had my first and middle names together. Because of that, it wouldn’t let me check in or pick a seat. Apparently checking in online isn’t that big in Korea, but requiring someone to sign up certainly isn’t going to help push people in that direction. At 1115a the next day, I arrived at LAX to find the Bradley Terminal buzzing. My contact was there waiting for me, and we checked in at the desk with a smiling agent. I was given a window seats at my request, and I was also handed a pass to the First Class lounge. I was in business, or Prestige Class, but Korean had arranged for the lounge pass so I could see both lounges (they’re in the same facility, just separated by a wall). After a few minutes in the lounge, we headed to the gate where most people had already boarded. That gate has two jet bridges with First and economy boarding on the lower level with Prestige upstairs. We took the ramp up and boarded. Several flight attendants were waiting at the door with a smile. They examined each boarding pass and escorted us all to our seats. After I was seated, a flight attendant quickly came by with a pre-departure drink. Another came by to introduce herself and she brought an amenity kit. Slippers were already in the seat back pocket. The seat itself was spacious with plenty of legroom ahead, but there was no place under the seat in front to store anything during takeoff and landing. That’s why the window seats on this airplane are even better. On the upper deck, compartments line the window the entire way. There was plenty of room for my computer and a bunch more if I needed it. We pushed back on time and had a leisurely taxi to the runway. I flipped on the tail camera and watched as we headed into the hazy sunshine. A flight attendant came by with a menu and I decided to explore the entertainment system. The screen is huge, and there was a lot of content on the system. The only complaint I have is about the headset. It’s a pretty cheap little plastic thing that seemed out of place. Meanwhile, the captain came on to introduce himself and told us basic details about the flight. I went back to staring out the window as we went northwest past the California coast. There is nothing like flying past the Bay Area at altitude on a clear day. I was asked to order both my lunch and dinner entrees in advance. I chose the bibimbap for lunch and the udon noodles for dinner. When lunch came, they started with a little appetizer followed by mozzarella and tomato. Then the bibimbap came, complete with instructions on how to put it together. After lunch, dessert was offered, and I had the ice cream; a little personal-sized Haagen Dazs cup. After that, the lights started to come down and the crew asked everyone to close their window shades row by row. Apparently it was time to sleep, but I knew that wasn’t happening. I went to explore the airplane. Korean has only 407 seats on the A380 and it’s not hard to see why there are so few. There is a lot of other stuff on this airplane besides seats. I was in the front cabin on the upper deck (it’s all business class up top). In the front (where Emirates has its showers), Korean has lavs on one side and a little self service lounge area on the other. You can make your own drink and have a seat. We went downstairs and visited the very private First Class cabin. There was only one seat out of twelve filled on this flight, and that must have been a surreal experience for that guy. Then it was time to pass back into coach. It was packed, but the legroom was good, as was the in-seat video screen. At the back of the coach cabin is where it gets really interesting. There is an entire Duty Free “Sky Shop” set up in the back. It has a counter staffed by a flight attendant and there are even video screens behind giving it more of a retail feel. Then we went back upstairs, but this time we took the rear staircase. I’m not sure how I missed this originally, but Korean has a large lounge called the Celestial Lounge back there. This was sponsored by Absolut in a big way. The bartender is trained by Absolut and they have a variety of Absolut cocktails they make. They even have a TV monitor that just rotates the various cocktails. The space is actually very cool and has room for probably 8 to 10 people to sit depending upon how cozy they want to get. We sat there for over an hour just having a drink and talking. I started to feel a little sleepy, so I went back to my seat. I flipped on a movie and dozed off… for about 10 minutes. Then I woke back up and somehow wasn’t tired anymore. I watched another movie and then finally gave up. I picked up my laptop and went back to the lounge where I was able to get some writing done. I really can’t explain how much I loved this lounge. There was something fantastic about being able to go do work outside of your seat area. About 5 hours before landing, they started turning the lights on and began preparing for the second meal service. This seemed way too early to me, but I went back to me seat anyway. They asked if I was ready, and I asked if I had a choice. She said she would be happy to serve me later if I wanted, and I took her up on that offer. I was not that hungry. Instead, I turned on some music and watched the tail camera while I did some more work. Around 3h30m before landing, I finally started to get hungry, so I rang the call button and a flight attendant was at my seat in seconds. She brought me my meal quickly and the udon noodles were really tasty. The only problem is that they’re hot, and this is a big deal on Korean. I have heard several reports that Korean keeps its cabins too warm, and since the A380 has no personal air vents, there’s not much you can do about it. I didn’t have much of a problem until I had those tasty, hot noodles. Later, I found out that cabin temperature is an issue for the airline as many Koreans think the cabin is too cold while American think it’s too warm. It’s hard to find the happy medium. After dinner, I had fruit for dessert and then some green tea. I settled in to watch another movie and almost nodded off but could never quite get there. We were soon passing over Japan, and my movie was over. When it flipped off, classical music came back on and it was Rhapsody in Blue. Even though I wasn’t flying United, there was no way I was turning that off. I listened and drifted off again for a few minutes of sleep. I woke up as we were passing over the Korean coast. It was clear but hazy most of the way in. We touched down a little early and taxied back to the terminal slowly. We only had to pause for a United 747 to take off for San Francisco. That was quite fitting with Rhapsody still ringing in my head. Once off the airplane, we took the 5 minute shuttle to the Hyatt Regency Incheon. There’s a big banner for Korean Air on top of the hotel and for good reason; Korean Air owns the property. The hotel itself was really nice, and they put me on the top floor with a view of the airfield. Unfortunately, it was pretty hazy, so my view was limited. I was tired but determined not to waste any time in this country. We went into Seoul (about a 50 minute drive) and went to the top of Mt Namsan. After, we had dinner and then went back to get some sleep before our next big day of travel. I’ll have my post up on travel to Jeju Island and Busan soon. I didn’t realize the A380’s didn’t have personal air vents.. Any reason why? Also, perhaps they should calculate the percentage of Americans vs. Koreans (by address perhaps?) and adjust the temperature accordingly, this way they’d annoy fewer people. Nick – I have no idea why the A380 has no personal air vents. Every airplane should have it, as far as I’m concerned. It’s funny that the hot/cold on board was mentioned. I’m a Korean-American and I get way too hot in Korea, especially when I fly Korean. My wife is from Korea… she always complains that it’s too damn cold. I took Korean out of IAD and JFK numerous times in coach and in business and I always wished there was an air vent. Anyway, I have the same issues at home too so I tend to have to deal with sleeping in hot weather. Such is married life! Problem 1: too warm cabin. There was someone (American) stay in shirtless near my seat. It’s even warm for Koreans used to live in US for a long time. No vents not only in 380 but across on all Korean air (and Asiana) fleets. Problem 2: all ICN bound flights from US offer second meal too early. By the time we arrive ICN, we’re starving. For flights from east coast, even a light meal between two meals comes before the too-early second meal. So there are three meals at a very short period and nothing for the last 5 hours before landing. Starving. I enjoyed your post. Can’t wait your next post. This post is awesome, and I’m excited to hear more about your time here. I just wish I’d known you were in Korea. We could have had a Cranky Appreciation fest! Harold – Well, I barely had time to sleep while I was there, so sadly no time to hang out with folks. But I’ll do my best to make some time if I ever get back there again! KE/Hanjin actually realize the need to provide complementary services and ENCOURAGE tourism and cultural awareness – from the food on board to the activities on the ground. (Why can’t the US airlines do this?). Nice report, and looking forward to see your ground experience in Korea (and ICN which is really nice). With only one person in first class, it sounds like KE doesn’t do upgrades for (at least) high mileage Business travelers. With a Duty Free shop and soumd lounge areas, it’s almost what Airbus said would be on A380’s. Just need the gym, spa, and bowling alley to be complete. David SF – Korean actually does have mileage upgrades from higher fare business class tickets. So there is a way to upgrade, but it’s not as generous as on US airlines. Upgrade ? .. 1. Firstly, pay for the class in which you wish to travel. 2. Only if a cabin is overbooked, should a passenger be provided in a cabin of superior service. I’ve flown KE twice (in coach) and been impressed both times. The ICN airport is a cinch to make connections in. Their staff was both gracious and competent–what a combination! The odd thing at the airport are the putting greens outside some of the gates–obviously not usable but interesting decorations. Re: online check-in: “I put my first name as Brett whereas the ticket had my first and middle names together”. Good guess, but no. I flew the night B777-300ER rotation recently on a Korean (!) itin (I only tried to link my Skymiles account no. after purchase), and there just doesn’t seem to be a way to check in online. I jumped through ALL the hoops (signed up for their mileage program, restarted their website after several crashes, in utter frustration, called their telephone help line). No dice (on a biz ticket!). Had to arrive at airport extra early because of it, and sat in their crowded LAX lounge that has the worst Wifi speed and reliability I’ve had anywhere in recent memory. It’s a very strange thing: South Koreans are leaders in information technology, and everyone in Seoul is an Internet whiz. Yet one of their two leading airlines has an Internet presence that is more Air Koryo than (South) Korean Air. If they gave you the line that “online check-in is not a big thing in Korea”, then that’s an attitude of a company with a dangerous hubris and lack of customer focus. That most likely is also the reason why they effectively dropped out of the Skymiles program: too big of an ego. Remember, this is the same management that is currently preoccupied with building $$ billion hotel skyscrapers in downtown LA. Looks like they have taken their focus off running an efficient, customer centric airline. The marketplace usually renders a verdict. I contribute: I’ll avoid them for future travel. I flew an SAS A330 last summer that also didn’t have personal air vents. The first 2 hours of the flight were a test for my deodorant, that’s for sure. I always love these writeups, feel like you’re sitting right next to brett! Well now I have to ask the question, why are there no individual air vents? Not everyone has the same body temp, people dress in different type clothes that effect their body temp, meds people take can alter their body temp and male/female menopause cause hot flashes. How does any airline/airplane manufacture think they can ever keep the temp comfortable for everyone? The only thing to do it keep the cabin cooler and hand out sweaters, gloves and blankets to everyone in case they need them. Brett’s already heard from me on this, but I too just had my first KE experience over the past two weeks. JFK to BKK thru ICN, and back to JFK this past weekend. All in Prestige, the long leg on the A380, the BKK flights on a 777-300ER, I believe. Agree on the seat and service. Both are excellent. Weird thing about the cabin temp. The flights out were both very hot and annoying. Oddly, the flights home were super cold. I was happy – everyone else was shivering. The food is hit or miss. Some china, some plastic. Some great options, some gross options. I’m used to CX and BA level consistency and KE missed the mark on food. And yes, the second meal on both of the JFK/ICN flights were oddly timed. Also – no one used either of the lounges on any of my flights. People slept. Net, I flew because I’m now Skyteam loyal – I know, I know – and the KE Presitge ticket was 2K less than the DL ticket thru NRT. So overall, happy – and very happy for the price. 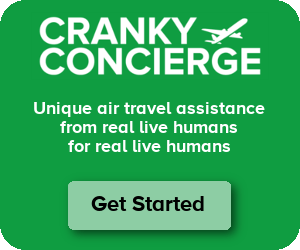 Great stuff Cranky- love the trip reports.. It is totally bizarre how poor airline websites are, and Korean is amongst the worst. You can’t just type in airport codes – you have to select a region first! It gets worse from there. I’ve flown KE business class a couple of times from ICN-LAX, on the 747 though and not the A380. The service was excellent and the bibimbap delicious both times, so it’s nice to see their service standards are still high. Curiously, I don’t remember the cabin being particularly warm either time. Then again, I tend to get cold very easily, so maybe I just didn’t notice. I’ve had the middle/last name combo problem on Cathay Pacific and sometime BA. Is KE on Amadeus and if so maybe that’s the problem? Also, other reviews have mentioned that the bibimbap gets boring after a few flights as its the main option. @RAW KE didn’t drop Skymiles cause of its ego. They dropped it cause they didn’t want to be held hostage by DL. Koreans and others will continue to fly KE and DL will feed people over NRT and eventually PVG with MU. Sanjeev – I believe Korean is moving to Amadeus Altea, but I don’t know if the switch has happened yet. I tend to think not, because my reservation code was a long list of numbers. As for the food, bibimbap was one of only three options. They also had grilled beef tenderloin or roasted salmon. So there was no shortage of options. And lastly, on SkyMiles, it sounds more and more like Delta did this as a pressure tactic. I’m going to put this up on Friday to discuss further. The flight report was greatly appreciated. It is immensely helpful to know what attention to service one gets for those premium fares. Missed the details about what selection of wines were available, if turndown service includes a mattress pad, noise level, and mid-flight snacks. The picture of the bibimbap looked awfully similar to the one served in economy from JFK to ICN. I learned to request the red chile paste tube in any meal service as the catering does not season most options. Looking forward to reading more! Jay F – There were multiple wine options, but I honestly couldn’t tell you what they were. I had a nice French red, but I don’t remember the detail and don’t have it written down. No turn down service that I saw. Noise was low – that A380 is great for that. And there were plenty of mid-flight snacks. I had some chips back at the bar. They also allow you to order things like ramen if you’d like. But I didn’t do it. So did you make it home with the Blue Label? mark – Hah, no. I decided not to buy it, though I did pick up something for my son and a little chocolate. That was a LOT cheaper. So the cabin crew asks you to lower the window shade “because it is sleep time”. But I want to look out the window all the time (true; and I frequently fly China-Canada). Now what? And we all know that in cattle class on Air Canada the cabin people don’t ask; they just reach across and snap the shade down, and scowl deeply when the cattle person raises the shade. CF: about an article on the window shade thing (like the recline thing)? Jim – I could have raised it and it wouldn’t have been a problem. The crew never pushed it and never missed a chance to smile at everyone. But with every shade down, I just felt like I didn’t want to bug people too much. That’s why a) I used the tail camera on the IFE and b) I went back to the lounge which had plenty of shades to pull up and avoid bothering people. They should install virtual shades à la 787, so the crew can override individual passengers’ actions. Kinda like the window lock button on the driver’s seat. As I once read on Skytrax, Korean Air really does love to “slam the cabin into darkness.” It makes for a very trippy 14 hours after a while. You could have opened the window shade, but I can attest that one open shade makes it awkwardly bright, especially for people on that row. The attendants will come around and tell you to close it..at least they have on all of my ATL-ICN RT flights where I’ve seen people do that. I’ve never found KE flights to be too hot. Oddly, the only time I was hot was when I sat on the left side at the window ATL-ICN. Little did I know that with the sun on that side of the plane the whole time, it was about 10 degrees F warmer when you rested on the window. It was actually too hot to the touch. “Needless to say,” no window seat for me again. Flying KE in Economy makes me feel special. Even though it is nothing special, their attention to detail and excellent service skills create that premium feeling. Brett – how much time did you get to enjoy in real Seoul? Did you try out the subway? Drink soju at a meat restaurant until the sun comes up? Korea is what I call the surprise country. I didn’t know much about it all before I moved here, but I absolutely love it. The same can be said for all of my friends that have come to visit me. ICN is consistently amazing. I remember the first time I flew back to the US, I was in SHOCK at their “wait 5 minutes to make sure your checked bag is clear through security” policy. SO. FAST. KE duty free is also no joke. Koreans LOVE LOVE LOVE duty free. We always joke that, when we go on vacation, if we don’t buy the gifts for coworkers at duty free at the foreign airport, the Koreans won’t touch it! Most Americans are annoyed by the aisle carts, but oh no, not Koreans. It is SERIOUS business. I even have to pick things up for my coworkers from Duty Free. Michael – I had VERY little time in Seoul itself, I’m afraid. We were just on the road most of the time. We went to the night market the first night and had a good meal. The next night, I stayed at the Lotte right in town and we went to this awesome traditional restaurant tucked away down a little alley. I couldn’t tell you half of what I ate, but the food kept coming and it was so good. Unfortunately, I was so exhausted at this point that I was seeing double. You are not kidding about Incheon and Duty Free. I’ll be writing about both those more without question. During my corporate travel days I had a great relationship with KE. I went on a fam trip to Vietnam. Catering and service were superb but you had to ask for another cocktail. They Weren’t stingy but the wouldn’t proactively offer a refill. One of the best business class trips I’ve had. I Just posted a post on my new blog that includes ICN. I’m would appreciate any feedback. How do the tray tables work? Is the height adjustable? If someone were fairly pregnant, would the tray table be able to be adjusted up slightly (so it wasn’t resting on the belly)? Sometimes tray tables in the armrest are really low. Random question but couldn’t find any info anywhere. Thanks for any help in advance!! Rhubarb – I don’t believe the height was adjustable. It might be a bit of a squeeze for you. Okay – thanks for the reply. Hm. Maybe I can put my seat in the flat position so i’ll be able to scoot backwards a little bit. I should still be able to take my tray table out even when my seat is in the bed position, right?